At Jack Dunne & Son we provide menswear and formal hire for Men. Choose from a large and exclusive selection of fashion formal wear, where you will receive individual attention and the highest quality service. 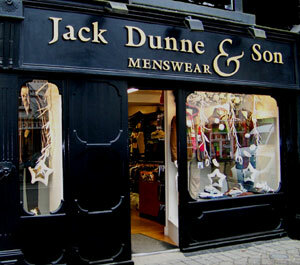 Jack Dunne & Son is situated in the main street of Gorey town, Co Wexford. Established in 1993 by Paul Dunne, the business trades as a leading men's outfitters and formal hire store. The business appeals to a broad range of males in the greater Wexford and Wicklow area looking to find that perfect suit for evening wear, casual daywear and formal attire for that special occasion. What differentiates Jack Dunne & Son from many others is our determination to develop exceptionally high standards of retailing excellence and customer service. Why not pop by and visit us in-store? Opening hours are detailed below or, alternatively contact me, Paul Dunne on 053-9421723. I would be only too happy to offer my advice.